On the heels of Halo Top's success in the low-calorie ice cream market, Ben & Jerry's launched a lighter line of their own, called Moo-Phoria. What began with three, cookie-inspired varieties back in February—Caramel Cookie Fix, Chocolate Milk and Cookies, and P.B. Dough—has just expanded with four brand new pints (well, almost brand new—one of the flavors is inspired by a Ben & Jerry's classic). The latest lineup includes Cherry Garcia with a Twist (a lower-calorie version of the B&J's favorite, with swirled cherry and chocolate ice creams, cherries, and fudge flakes), Chocolate Cookie EnlightenMint (mint ice cream with fudge truffles and chocolate cookies), Mocha Fudge Brownie (cold brew mocha ice cream with fudgy brownies and a toasted marshmallow swirl), and P.B. Marshmallow (peanut butter ice cream with gobs of marshmallow and peanut butter cookies). “While Moo-phoria sources organic milk and cream and non-GMO ingredients, what may be of interest to fans is what isn't in these light ice creams: sugar substitutes, sugar alcohols, and tons of calories," the company said in a press release. Each half-cup serving of Moo-Phoria has between 140 and 160 calories (or between 560 and 620 calories per pint), putting it about halfway between Halo Top (280 to 360 calories per pint) and regular Ben & Jerry's. And, while we haven't tried these new four just yet, Food & Wine staffers found the original Moo-Phoria flavors to be surprisingly creamy, and nearly on par with full-fat ice (some compared the line to Breyers or Edy's/Dreyers). Not interested in counting calories? 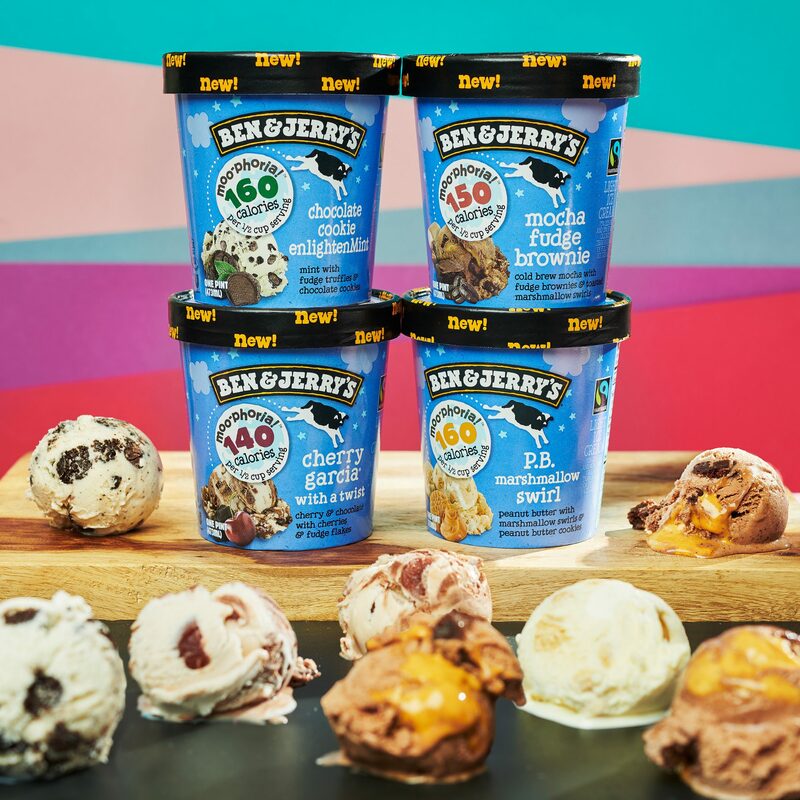 Earlier in the year, Ben & Jerry's released another batch of new products, including Truffle Pints dotted with giant candy chunks, and Pint Slices in classic flavors like The Tonight Dough and (again) Cherry Garcia. The brand also put out a couple more non-dairy, almond milk pints: Cinnamon Buns and Peanut Butter Half Baked.